GTL Infra – Entering into New League ! GTL infra has been in the news for this weekend after an agreement on deal with Rcom. More can be read about it online. Technically the stock gave its indication of a move around last week only by giving a breakout above 44.5. On weekly charts the stock gave a breakout around 44.5.Good accumulation was seen around 38-44 zone. Weekly closing above 50 should take the stock to 70 levels. Stoploss at 42 now. ACCUMULATE ON DECLINES UPTO 39 WITH STRICT STOPLOSS PLACED AT 38. PATIENT INVESTORS MAY BOOK PARTIAL PROFITS AROUND 45 AS IT IS A STRONG RESISTANCE ZONE. ONCE ABOVE 47 STOCK WILL MOVE INTO STRONG MOMENTUM BUYERS CONTROL AND SHOOT TO 58 & 67 IN MEDIUM TERM. Buy GTL Infra at 44-45 add on dips to 41-42 stoploss 40 tgt 50-55 in medium term. 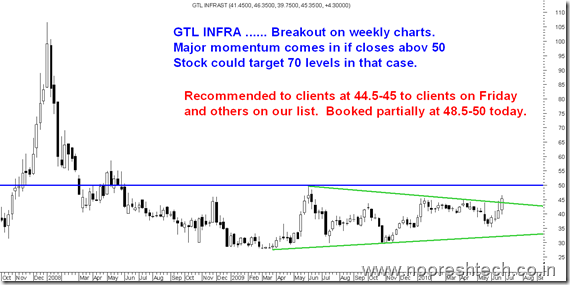 GTL infra earlier recommended in newsletter could give a strong move sustained closing above 46 for a target price of 60 for investors. Accumulate at current levels and keep position to add on dips. Partially booked today at 48.5-50 levels will look to add around 45 if comes or hold on to the position. Although market might have had a buzz of the news in last week but the crossover above 44.5 gave a clear indication for possible news in the offing.We got a good 10% pop 🙂 to reduce average cost. 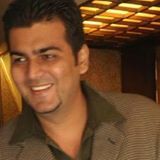 Hey nooresh, good to see you back posting regularly.. i have been holding this stock since 2008 and now this has given a new boost with merger with Reliance.. but dont you think it would put too much strain as the debt level would increase considerably for GTL group? if that is not the case, do u see this stock at 100+ or may be 250 + in coming 2-3 years? Well its a technical call on the stock and the debt levels could only be seen further on how fund raising and cash part of the deal is known. I see the stock at 100 over the next 2 yrs.